If you’ve ever been in the Bethesda Green office, you may have noticed the big Bethesda Green sign in the conference room. I’ve always assumed that everything in the Bethesda Green office is eco-friendly, and indeed, that sign is no different. It was created by Dave Taghipour and the team at Speedy Signs in Wheaton, MD. You might wonder, “How can a sign be eco-friendly?” The materials used to make the sign are one component, but the business practices of the company making the signs also matter. I produced special events for 16 years and signage was one component of just about every event. I became more conscientious about the materials used to make signs when I realized that foam core and foam board are not going to biodegrade and corrugated plastic, a material I once used on a regular basis, will take a very long time to break down in a landfill. So what materials should you use? According to Taghipour, “In place of acrylic and other plastic materials, one can use 3form materials. Made from ecoresin, their co-polyester sheet material contains a significant amount of both pre- and post-consumer recycled content. Their products range from 25% to 77.5% pre-consumer recycled content, to 100% post-consumer recycled content. Utilizing 3form materials can contribute to LEED points. In place of conventional banner materials, one can use BIOflex™, the first biodegradable vinyl banner material. 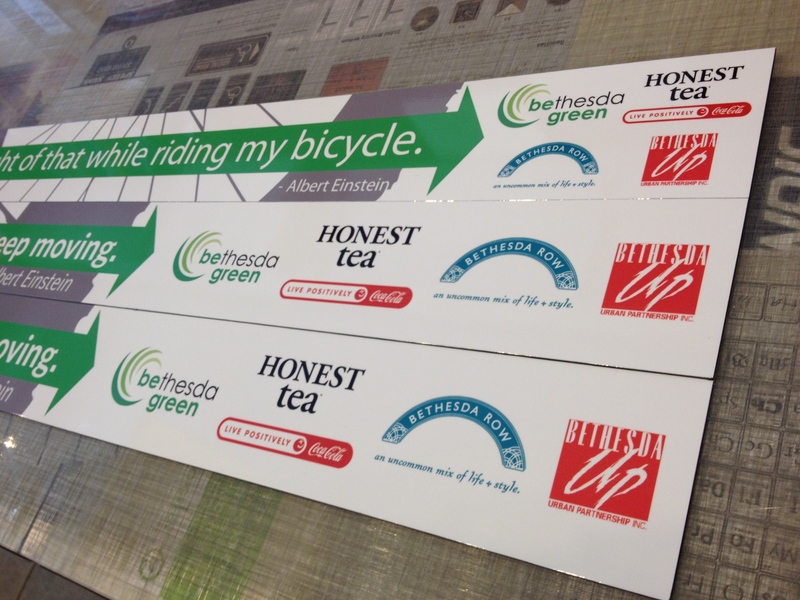 Recently, Bethesda Green had Speedy Signs make bike rack signs made of recycled aluminum and printed using bio solvent inks. Speedy Signs made these signs out of a plastic sheet containing approximately 30% recycled content, sandwiched between two sheets of recycled aluminum. Speedy Signs works hard to minimize its footprint in an industry that is full of scraps, vinyl, and waste. They start by purchasing eco-friendly materials when feasible (clients must be receptive and often be willing to pay a small premium), continue with consciously utilizing the materials to slash the amount of waste, and finish with recycling whatever scraps are left at the end. The post production vinyl scraps that are too small for their machines to use are absolutely perfect for creative use by artists and children, so they always look to give these items a second chance at utility before being so quick to scrap them. 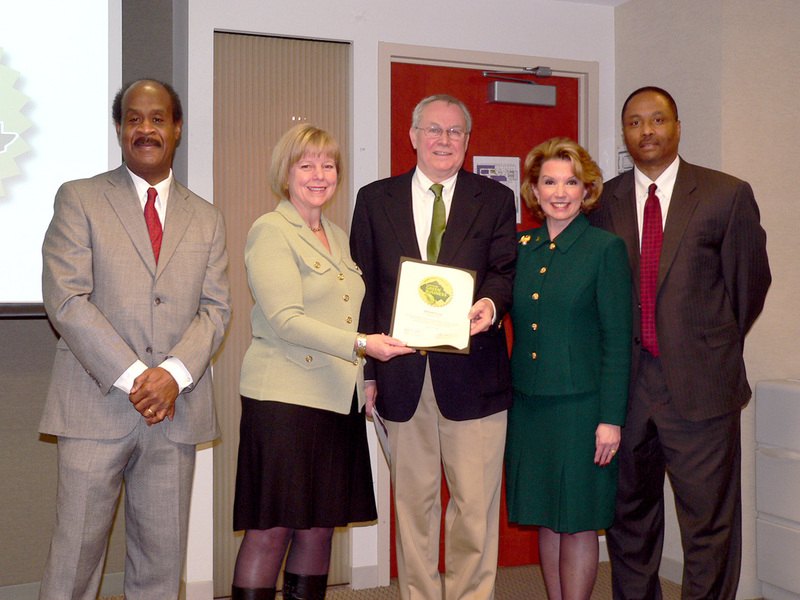 Although they we were one of the original 20 companies to obtain Montgomery County Green Business Certification in April 2010, they engaged in green practices long before then. For example, they were among the first businesses in the Wheaton area to join a buying group to purchase wind power. And even though the landlord at their previous location did not offer any recycling program, they have been recycling cardboard and other items by driving to the Derwood transfer station weekly since the company was founded. Taghipour, who also owns All-Eco Center, which sells sustainable building materials, was involved with launching GreenWheaton. Lori Hill is a sustainable lifestyle consultant and former green event producer. Visit her blog for more green lifestyle tips. Bethesda Green proudly received recognition as one of the first businesses and organizations to be certified by Montgomery County’s Green Business Certification Program. County Executive Isiah Leggett announced the program at a December 16 media event (see News Release). Ralph Smith, a Bethesda Green volunteer and President of Smith Design/Construction, accepted the certification on our behalf. Ralph and volunteer Cindy Powers took lead roles in guiding us through the process. Bethesda Green volunteer Ralph Smith (center) receives the county's Green Business Certification with (L-R) County Executive Isiah Leggett, County Council President Nancy Floreen, Montgomery County Chamber of Commerce President Gigi Godwin, and Montgomery College Interim Dean Steve Greenfield. Bethesda Green was among the first 11 businesses, nonprofits and organizations to be certified, a list that includes our friends from Honest Tea, Calvert and Clean Currents. To view the online certification application and other information about the program, go to http://mcgreenbiz.org. Interested in becoming a green certified business? Montgomery College is now offering courses to help you through the process. For a listing of offerings, click here.